Nothing is better than taking Fast Eddy out for an winter walk after supper. He loves the snow. Throughout the day, the snow slowly sifted down, giving the landscape a fresh clean powdered sugar appearance. Today’s bit of white fluff was but a mere 4 inches. I found that the 8 o’clock usual darkness was replaced with a peaceful white reflection of the snow. The night had a cozy twilight blanket cast over it, muffling any sounds . 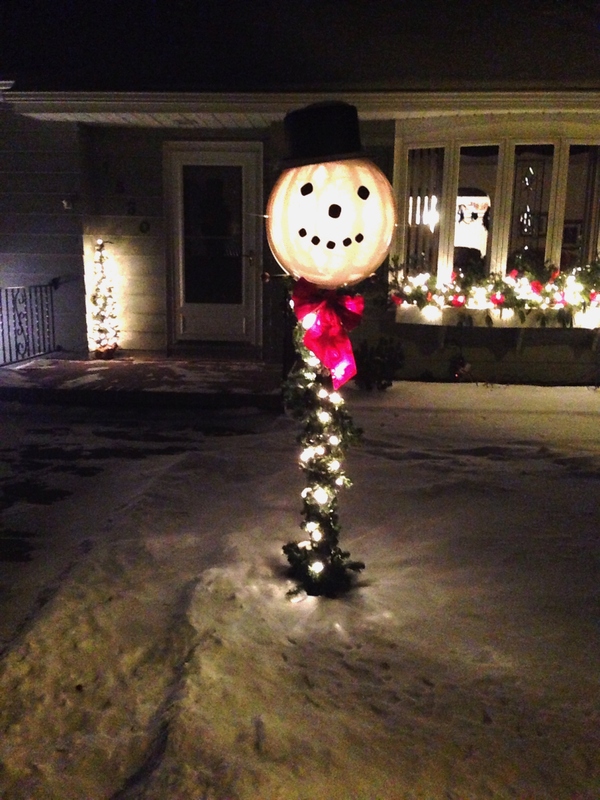 Many houses on my walk had caught up the Christmas Spirit. Their strings of lights brightened the night with colorful outlines of their homes. Some houses had an added dimension with sparkling trees, deer, sleighs, nativities, snowmen, or Santas on their front lawns. I wonder what Eddy thought about all of that. Coming home tonight, I was still restless and wanted to stay outside a bit longer. Even thought it was 5 degrees, I felt warm from the walk and the overkill of my outer clothing. I realized that the sidewalk and driveway were going to have to be shoveled by morning. I like a slow morning with my cup of coffee and know I would not feel the same enthusiasm for snow removal in the morning. Not feeling the desire to shovel any more after our week of heavy wet snow, I fired up the snow blower. Contrary to a gentleman around the corner and on another block who told me he enjoyed shoveling the light fluffy stuff, it was good exercise. Having completed my 30 min walk, I decided, no shoveling for me, it was time for the snow blower to come out of hibernation. I plugged it into the electrical outlet in the garage for the auto start. Zing…it purred immediately. I adjusted the top of the blower and popped it into high gear. I made several quick passes on the driveway and my section of the sidewalk. I decided a couple more passes would clear the snow for my neighbors to the north and the south, so I quickly did their sidewalks, too. Nothing is better than finding your neighbor cleaned off your section of the sidewalk. A nice surprise for them in the morning. I finished off the winter chore with a little hand shoveling. Reluctantly I headed into the house. I wanted to stay out longer, but had nothing more to do. 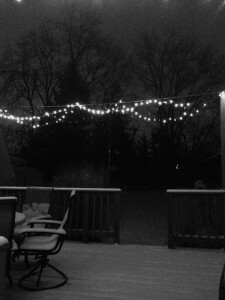 If I had my snow pants on, I could of sat on the deck and listened to the night and watched the star lit sky. Or I could have laid on my back in the snow and made a snow angel and be mesmerized by the night. Ah, another night. Winter is young yet. There will be many more chances.